Chatting my friend Tony yesterday the subject of conversation turned to feet _ he’d been reading my recent TGO piece. He asked how my heel pain (Plantar Fasciitis) was at the moment. Well, the good news is that this is has not really been a problem for twelve months now. A lot of experimenting and following tips given by readers here seems to have made a big difference. Tony suggested writing about it. So, here we go. These are some of the things that I’ve done which seem to help! I’ve had a few emails recently about these feet conditions as a result of some of the pieces I’ve written about my own feet, and search for solutions. I’m not an expert at this, but this is what I now know! It might be useful! Apparently, as we get older, 70% of us develop some kind of painful foot condition, often related to ‘Over Pronation’ which is the flattening of the feet or inward rolling of the feet when landing. You can see the often sometimes dramatically with wear and tear on you shoe soles. Pronation is important to the absorption of shock. Over pronation can cause stress, muscle fatigue and whole host of other things. Ophthalmic inserts and one solution to a lot of these foot conditions. You can have your feel measured by specialists who can supply you with bespoke inserts; I know a couple of people who simply couldn’t walk without these. Bespoke inserts can be expensive as they have to be replaced regularly. There are a number of commercially available inserts which aim to do something of a job and this is what I have been using. For me Plantar Fasciitis has been very painful and almost debilitating over the last 12 months, partially the reason why there hasn’t been so much walking content here. After the TGO 15 Challenge I was in such a bad way that I basically rested the foot of the rest of the year! This is a problem I get in my right foot, more precisely with the Achilles tendon on the heel. This can get sore, very sore. The inflamed heel is often very painful to the touch. Using inserts have made a difference. I recently came across an exercise which gently stretches the Achilles and eases Plantar Fasciitis. As I hadn’t come across it before I thought I’d share it. The idea is to find a step and to cling onto the step with your toes, leaving the rest of the foot dangling over the edge — hold on to some kind of rail or door handle. Straighten you legs, i.e., from your heel downwards. Hold the position and you will feel burn in your calf muscles. Hold the position as you would with many exercises. I can feel the strain in my Achilles. When you straighten up and walk properly again pain is often significantly relieved. It is pretty easy to do this on the hills. Some mornings, when breaking camp, it takes me time for the heel to warm up but on other days the main is more pronounced. It is fairly easy to find a large stone, the side of a stream or other steep slope to do this exercise to — use walking poles out front for stability. If you are using a stream then obviously, take care not to fall in. No, I’m not saying anything! I have been using inserts for a couple of years now, both in ordinary shoes and in training/trail shoes. I’ve been using Dr Feet insoles which are readily available from Amazon and the like. Like Superfeet you need to break them in slowly but they are a different kind of product to Superfeet — we are not talking about the same thing. Recently I’ve started trying another brand, Pro 11 Wellbeing, as they sell a ‘Dual Shock’ system for running and walking. I’ve noticed that high impact surfaces such as tarmac and small chipping laden tracks are bad. So, I shall report back on these and have a look at whether they are more effective. My pair cost less than £7. 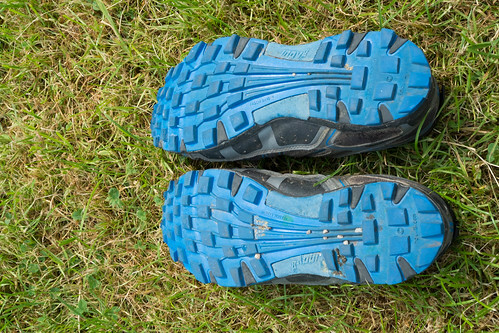 I first discovered Inov-8 shoes through a piece that Cameron McNeish wrote in TGO Magazine. These shoes seemed to counter all of our received wisdom when it came to hiking shoes. I phoned Chris Townsend. What did he think? Chris gave them a raving review and I never looked back. I used Inov-8 Terrocs through two iterations after which these shoes were sadly discontinued. By this time — as tends to be the case with shoes — the Inov-8 range had grown to a bewildering size. Now that the Terrocs had gone what should I do? I had tried the Roclite range when they are introduced. There was much to like about them but the fit was far, far, too narrow for me. I have never been quite sure about the Mudclaws on all terrain and so after the demise of the Terroc I tried a while range of other shoes with very mixed results. I had a good look at the new Inov-8 range in Covent Garden and wasn’t impressed with the build quality. However, a new shoe had been introduced to the range, the Roclite 295 and critically these were available in a wider fit — the Standard Fit. Bob Cartwright used a pair of these on the 2015 Challenge and complained that they fell apart. 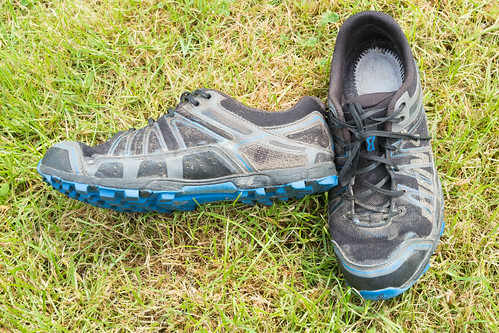 To be fair to Inov-8 they replaced the pair and Bob had the impression that there had been a bad production batch — something that is not unknown to all gear manufacturers. Just when I was beginning to despair about finding a decent replacement for the Terrocs Colin Ibbotson told me that he had bought a pair of 295s and that they seemed perfect, so much so that he ordered another 2 pairs (such are the demands of a long distance hiker). I bought a pair. For a while I thought I would be set on another brand of shoe but they didn’t make it through a three day backpack in the spring. Despite only using this 295s for one short day walk I decided to take them with me on the Challenge. So, how did they fair? I ordered a half size bigger than my shoe size and there certainly was a lot of space in them. This was certainly not the initial Roclite fit (which is now described as Precision fit). I wondered whether they were too big. The first days of the Challenge were unusually hot and my feet certainly appreciated the extra space. The bottom line was that the 295s performed superbly and I’m now back with Inov-8. The 295s have a mesh upper which is reminiscent of the Terroc, however, this is a far more robust material. The shoe drains water try quickly and although not a scientific observation my feeling is that these are as good as the first generation Terrocs and maybe a bit better than the second generation Terroc. The sole unit of the 295s is more robust than that on the Terroc and gives more cushioning. These shoes are unmistakably Inov-8 shoes but they are probably the most comfortable that I have used yet on a multi day trek. Two weeks crossing Scottish heather moors and peat bogs tends to take its toll on trail shoes. Before setting off I adopted the same technique as I used to do with the Terrocs, I seam sealed the stitching on the shoe. In the photo at the top of the page you can see where I had sealed across the top of the shoe, an area with the Terrocs that was prone to developing a hole. We may have been helped this year with drier than usual conditions but at the end of the two weeks the shoes were pretty well intact. There was no hint of the shoes beginning to fall apart. At the end of the event I compared notes with Colin Ibbotson who hadn’t seam sealed. He seemed just as impressed with the robust nature of the shoes. The sole unit of the Terroc was of a softer composition than that on the 295s. The Terroc unit always showed significant wear at the end of a two week trek. This wear was more than compensated for by the grip of the Terroc on a range of surfaces. The 295s proved to be comfortable on grass, on steep slopes, on rocky tracks and on tarmac. At the end of two week the west on the sole is minimal as you can see below. All in all I was very happy, indeed impressed, with the 295s. All in all I thought their performance was better than the original Terroc. This is the best trail shoe I have backpacked in yet. The range of the Inov-8 is still bewildering in its size and complexity. There seem to be a number of other shoes in the range that might be suited to all terrain walking but Inov-8 claim that the 295 is their best all-terrain shoe; I certainly had no complaints. The wider ‘Standard’ fit has made a big difference. I’m not quite sure though that is the same as the Terroc. Comparing notes with Chris Townsend at the end of the Challenge he told me that he’d tried the 295s last year and found them to be still too narrow. Like me, Chris has wide feet. I do wonder whether he had been trying out a Precision fit but on one foot I did sometimes think there wasn’t as much room as in the Terroc. But on balance these shoes were very, very comfortable. So on grounds of good grip on all terrain, on comfort and on durability I have no hesitation in recommending these shoes. Amongst the Challenge lightweight gear aficionados there were some new choices of shoes and brands this year. I’m going to see if I can get some of them to write a review for me to post here. It is nice to know I’ve got Inov-8 back. So, the feet have been a bit of a problem over the last seven or eight months. Way back at the end of 2014 I started the search for some alternatives to the Inov-8 Terrocs. I settled on Brooks Cascardia 10s. They seemed to be quite comfortable. For the Challenge I bought a new pair of Cascardia 10s. I assumed these were just the new version of the Cascara other than a different boot. Then everything seems fall apart. Updated 11 December 2014 — Ed. The Cascardia Trail shoes arrived late this afternoon. So how’s the fit? To recap I used the Brooks US site to check the comparison between size and fit of the Inov-8 Terocs and the Cascardias. The site seemed to suggest the sizing and fit was compatible. I then ordered these from Amazon who quote sizes in UK measurements. I ordered my usual size 9 but thought about going to the bigger half size (these are available). I have two feet that are different sizes. One is probably a little bigger than the standard size and the other feels a little lighter. While I have wide feet I have narrow heels and up-sizing often leads me with shoes that are not tight enough at the rear. The Cascardias are very compatible with the Terrocs. The fit on my feet is right enough. These being trail shoes they will stretch a bit and so allowance has to be made for that. I often find one small toe struggles with new shoes;this was never a problem with the original Terrocs although more of an issue with the second generation. these gave me some problems using thick Smartwool socks at first but were fine when I switched to Teko lights. There should be no problem with X-Socks with the Cascardias. Overall, I would say that they were marginally more comfortable out of the box that the second generation Terrocs. I understand the point about the soles now; they are nowhere near as aggressive as those on the Terrocs but they look as if they will do the job. I hope to take them out onto the hills on Saturday. I shall report back. I took Andy Walker’s comments below seriously and have spent more time with these shoes (before going onto the hill) and thinking about whether I needed to exchange these for a half size up. There is no stress on toes with this fit. I have tried them with both X Socks and Teko merino socks and they feel OK. My main problem is with big toe space in my right shoe and thought I might want a bit more clearance there is no pressure or tightness here. In terms of feet expanding through heat there seems to be enough room for that (as feet don’t get longer). On balance I will stick with the UK size. It is a balance though and should you order these I think you have to prepared to experiment and move up half a size. I need a new pair of trainers and so will stick with these whatever. I think I am going to be OK with the size, but I will report back! TGO Gear: What To Do With the Feet Now Terrocs Have Vanished? My only real bit of gear dilemma to deal with at the moment is what to put on my feet! After the best part of 10 years Inov-8 have killed-off my favourite trail shoe, the Terroc 330. A couple of years ago the Terroc was ‘improved’. A new design was a little more robust, had a bit more cushioning in the sole and was pretty comfortable. What I liked about both Terroc models were that they were reasonably wide fitting, as I have awkward feet. Inov8’s Roclite range were just too narrow for me. I bought a few pairs of the latest 330s when I realised they were to be discontinued but I’m now down to the last pair. One of the great things about the internet is that you can instantly take advantage of the experiences of others and this morning I’ve received a lot of recommendation. Inov8’s range (since being bought out by a North American outfit) has become more and more bewildering. Back in the day the company recognised that hill walkers were going for their shoes and they included this category on their website. These days their site is nowhere near as helpful. So, you’ll see how pleased I was to find an alternative that boasts just about one of the most helpful websites I’ve found so far. Keith Foskett (and a few others) recommended a new trail shoe, well at least new to me. This is the Cascadia 9 shoe from Brooks. These shoes are now available in the UK but — if you are at all interested — I urge you to gave a look at the Brooks website and not just that of resellers. The Cascardia 9 looks promising from the start but the web page is incredibly helpful. A little bubble with ‘What’s my Size?’ takes you to a really helpful interactive display. Using this display you can input the brand and model of a shoe that you have traditionally liked. I inputed Inov8 and then Terroc 330 and got a read out that told me what the corresponding size was for the Cascadia 9. The interactive tells me that this is a good fit in terms of size, comfort and — most importantly — width. I was able to order with confidence. These look promising and I have ordered a pair. I shall report back! Well done Brooks in helping customers make informed decisions. You’d almost think they have Inov8 owners in mind when they devised this. But, surely not? Young readers beware. Regardless of how fit you are the older you get the more things tend to simply stop working properly! Occasionally I’ve written here about health related issues and I’m glad I had. My piece on back pain ended up in me being recommended the most useful book on the subject I’ve come across. I was able to share the book with others and I know from feedback it has helped others as well. So, to feet. I’ve always had problems with fallen arches especially with my left foot. This has simply meant that walking on this foot can be quite painful. The problem has got worse and on the recent TGO coast-to-coast walk it became so painful that I decided it was time for action. I was surprised to find a solution that was simple and reasonably cheap!